Climbed April 17. 2005 and October 2. 2016. How to get there: From the west (Bergen), the best approach is to drive Hwy. E-16 to Lærdal, drive through the village and continue to Årdal, then up the valley to Øvre Årdal and finally up the lower part of Utladalen valley until the gate that closes the upper part of the road to normal traffic. (Signs for Hjelle or Utladalen). Travel time from Bergen is about 4 hours. This is the trailhead. There is parking on the left, this location is north 61:20.820, east 007:52.769, elevation 110 meter. Hut climb: The first part follows the nice little road serving the farm Vetti. This road crosses the river several times as it winds its way up the very impressive Utladalen canyon. After 4 km you arrive at Vetti. Just above the uppermost buildings there is a fork in the trail. The trail that continues up the valley, first goes to the base of the famous Vettisfossen waterfall. Another trail forks right through a small gate in the fence and climbs directly up and out of the canyon. This is your trail. This location is north 61:22.507, east 007:55.694 with an elevation of 350 meter. Continue up the steep trail to the rim of the canyon. This may be tricky early in winter, but should pose no problem from mid March, however crampons may be needed if the path is icy. 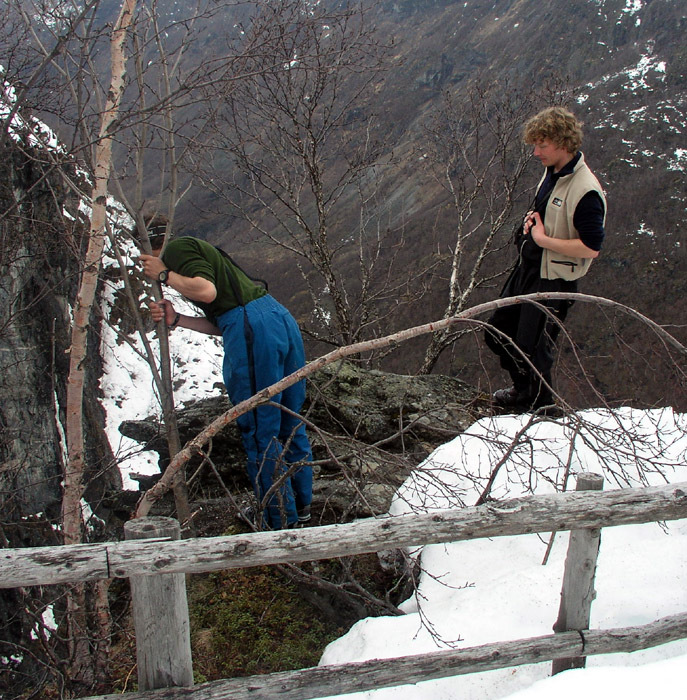 As soon as you reach the rim, continue along the trail that runs north to the Vettismorki farm cabins. The trail forks, the left branch is perhaps the best one in order to get to Ingjerdbu. This trail also pass a viewing platform for the impressive waterfall Vettisfossen. Ingjerdbu is a self serve (no food) DNT mountain hut. It is locked with the standard lock and the 2005 charge was 180 NOK per night for members of DNT. 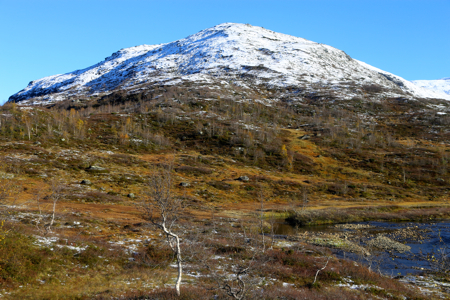 Mountain climb: From Ingjerdbu, take the T-marked path north. 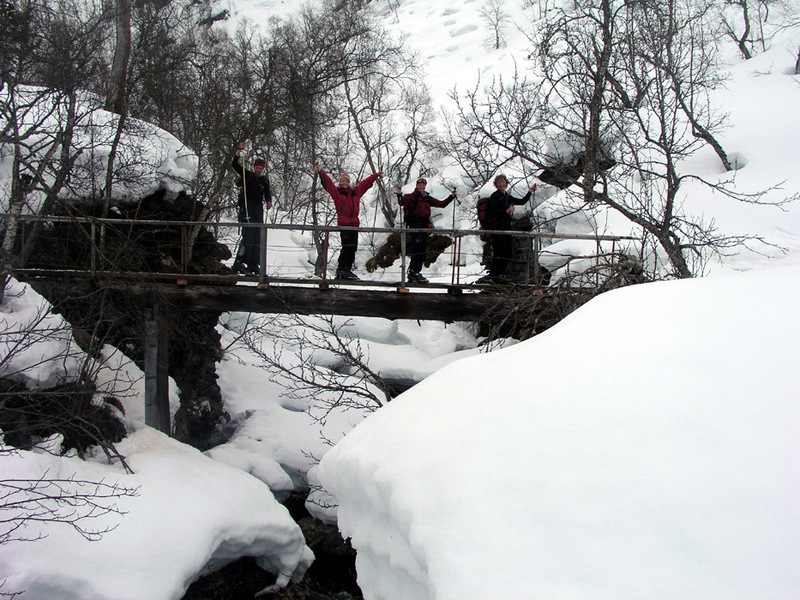 This trail crosses the river Fleskedøla on a bridge, then climbs the ridge anong birch trees. The trail follows the ridge north, first flat, then a more distinct climb from about 1000 meter of elevation. Leave the trail around 1250 meter and continue along the ridge to the summit. This route is about 6 km one way from Ingjerdbu, it is quite easy with no difficulties. The view into Utladalen and across to the mountains on the opposite side is very good. After visiting the west summit, elevation 1503 meter, you should continue in a wide arc going north, then east in order to visit the highest point at 1506 meter. From here, descend back down to merge with your route of ascent. Comments: I did this climb with a group from The Bergen Mountaineering Club (DNT Fjellsport Bergen). After a long day to Falketind the day before, this was a trip to enjoy some views and skiing. We started from Ingjerdbu at 0930, reached the summit cairn at 1230 and returned to the hut at 1345. This time included a good break for lunch at about 1300 meter elevation on the ascent. 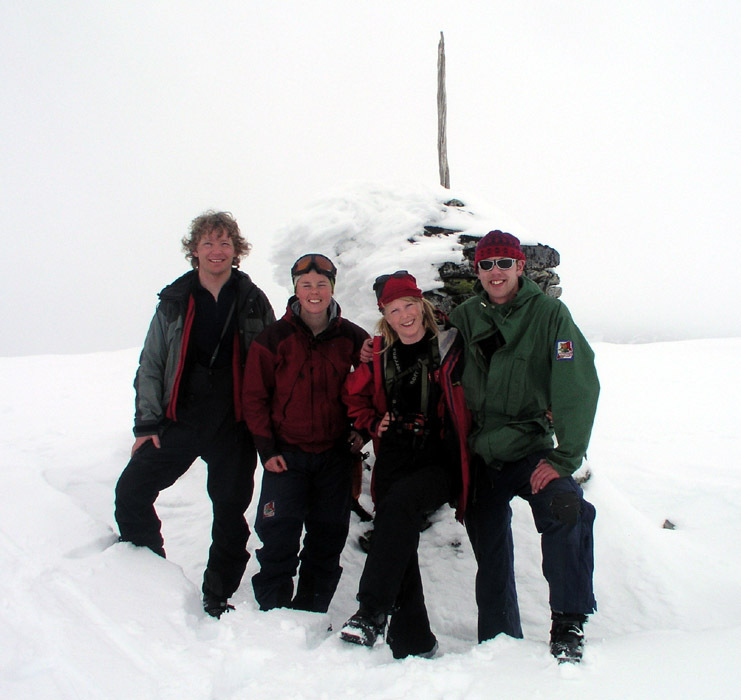 It should be noted that the named peak (Friken) as well as the cairn is placed on the 1503 meter west summit, while the highest point is almost 2 km east (somewhat south of east). We did not even see the east summit due to fog and I had not checked the map very carefully in advance. The west summit has a primary factor of about 80 meter to the higher east summit. The main attraction is certainly the views of Utladalen and Midtmaradalen, and this dictates that the (lower) west summit is visited. One can easily ski by the east summit on the return route. After 11 years, it was high time to return to Ingjerdbu. Also this time, a trip organized by the Bergen Mountaineering group of DNT (Bergen Fjellsport). On Saturday, I climbed the impressive Hjelledalstinden. The weather was not good on this climb, but changed to near perfect on Sunday. It was therefore decided to climb Friken, a sort of small mountain, but with a very good location what regards its summit view. Thus, my program for this weekend ended up being quite similar to my first visit to this area. Friken as seen from the south ridge. The Friken cairn. This is the 1503 meter west summit. 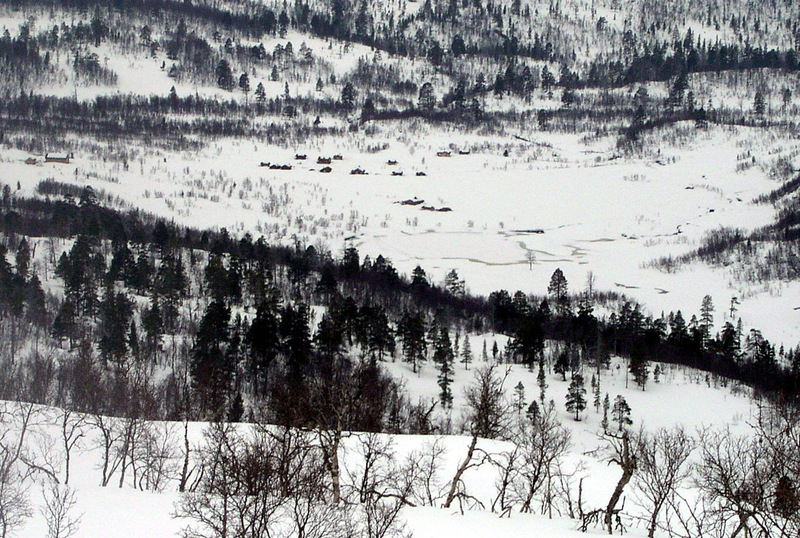 The Vettismorki farm cabins as seen when returning from Friken. Ingjerdbu can be seen a bit off to the left. 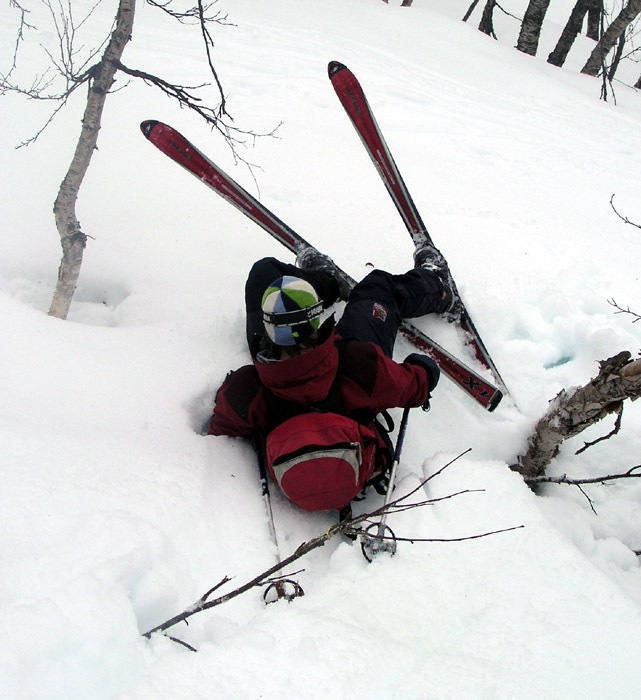 Skiing among birch trees is not always easy. On the bridge crossing Fleskedøla. Vettisfossen, one of Norway's finest.